If you use a routine, GymGoal opens this page. If you are using a list of exercises instead of a routine, GymGoal jumps straight to the selected exercise, but you can open this page by tapping < at the top. Workouts in History have titles and subtitles. When you start a routine-based workout GymGoal automatically copies the split day name to the title, and the routine name to the subtitle. Here Upper day of Upper/Lower routine is started. It is important to record the correct workout duration, because it is used to calculate calories. 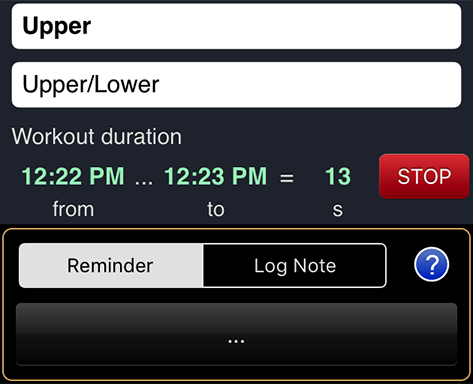 GymGoal automatically starts the workout timer. You can Stop the timer and change the start time if needed. Reminder is just a text. It will be displayed here whenever you start a workout based on this particular routine. It is not logged. Log Note will be saved to History.